D3 Publisher Inc. has recently announced the official launch of the latest installment of the Earth Defense Force franchise, Earth Defense Force 5 for the PlayStation 4. 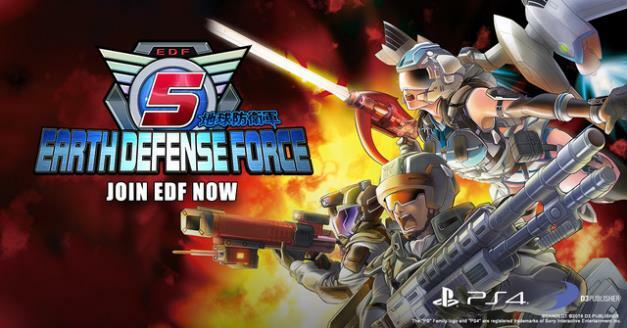 With Standard and Deluxe Editions now available to purchase and play via the PlayStation Store for the first time since its Japan-only launch in 2017, Earth Defense Force 5 continues traditions set by the wildly popular series. Since it first launched in 2003 for the PlayStation 2 console, the Earth Defense Force series has earned a reputation for its relentless wave shooter gameplay with tons of enemies on-screen, its wide array of unique classes, weapons, and loadout combinations, and its charming B-movie dialogue and settings with cities under siege by giant monsters. This focus on delivering an overwhelming scale of enemies and a sense of exhilaration continues with Earth Defense Force 5, featuring the most detailed enemy models featured in the series to-date with breakable limbs and body parts and more advanced AI behavior. Packed with tons of content and high replay value, Earth Defense Force 5 delivers over 100 missions with more than 1,000 weapons and armaments to unlock and master. It also offers players four unique classes to master, allowing players to approach mission goals and objectives in a variety of ways. Classes include the Ranger, a well-rounded infantry soldier, the Wing Diver, a highly mobile air unit, the Fencer, a heavy weapons unit with thick armor, and the Air Raider, a support focused class with the ability to drive vehicles. With multiple options for multiplayer, Earth Defense Force 5 also offers up to four-player online co-op as well as offline couch co-op, supporting up to two players via split-screen.